At Digital Harrisburg, we are starting a new #ThrowbackThursday, where we examine an issue of the Harrisburg Telegram that came out exactly 100 years ago. On this day in Harrisburg history, an open-air dance was held in Market Square during the celebrations for the Harrisburg’s First Merchants’ Uniform Fall Opening, which seems to be an equivalent to a fall festival. It would start with a parade from the corner of Chestnut and Front Street to Market Square at 8:30 p.m. which is a five-minute walk whichever way you go. Music started at 9 p.m. There would be dancing up until midnight, with a contest for best and most original outfits for both genders. Just imagining a good proportion of the people of Harrisburg packed together along the few blocks of Market Square attempting to make enough room for dancing makes my head hurt. The logistics alone seem mind-boggling. However, the author of the article believes, or is at least trying to convince the public, that it will be a safe and fun event. Floodlights would be put in around 8, while police officers would surround the Square, keeping non-dancers out. Trolley transportation through that side of town would close down from 9:30 to 11. Two things struck me about this event and the article about it. First, the article is sure to advertise the companies donating their time and equipment to the event, such as the Harrisburg Light and Power Company as well as the Columbus Hotel. Second, I was surprised at the time of the event. It’s strange to imagine people in the 19th century partying at midnight, but I suppose living in a major city allowed for such a lifestyle. This one event was a part of a much larger festival, which clearly is an effect of the need for city pride during the City Beautiful movement. It should create a form of unity throughout the city, one that many would say is lacking today. 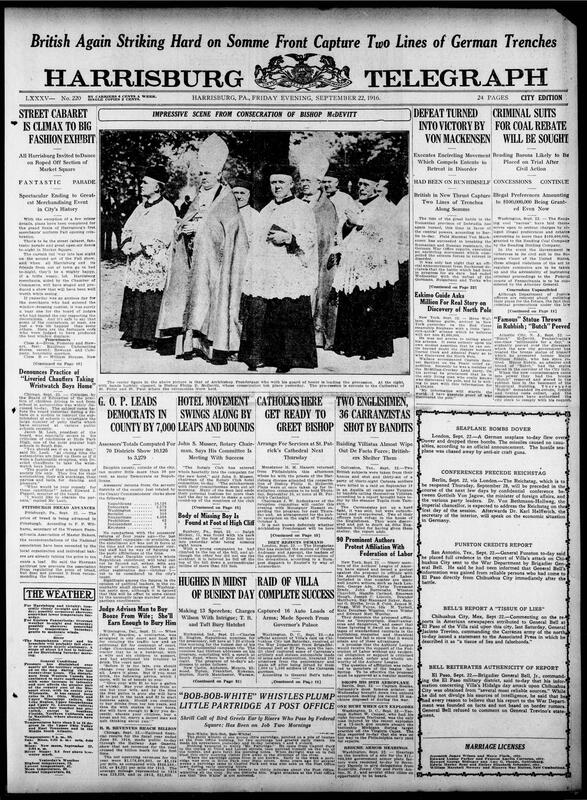 The main story of September 22 in the Harrisburg Telegraph featured the consecration of Philip R. McDevitt, the fourth Catholic bishop of Harrisburg, which occurred the previous day. Click on the image in this post to read about these events from the front page of the Telegraph on September 22.